The uniblock gear case machined on all sides, the particularly stable case and minimum outside dimensions enable diverse mounting options and applications. As a result, these motors often form an integral part of our customers� machine designs. 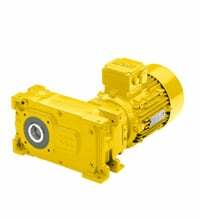 High precision manufacturing and top gearing quality guarantee minimum backlash in Watt Drive gear units. Unbelievable price on Parallel shaft geared motors in Shah Alam (Malaysia) company Watt Euro-Drive (Malaysia), Sdn. Bhd..